Hey everybody it’s Andy. I’m going to do this week’s burrito baby update, because Kerry is too busy napping. I kid, I kid. 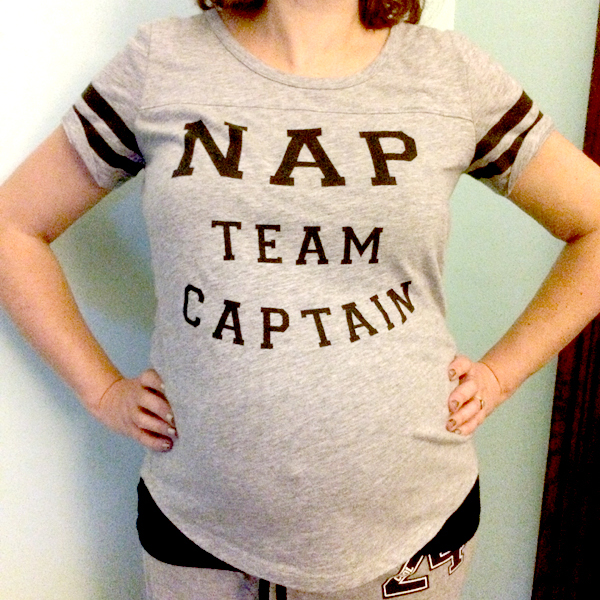 But she does have this shirt, proclaiming her status on the Noonernagel Nap Team. And for those of you thinking it was an easy choice giving her the “C,” I want you to know there was a lot of thought that went into this. Sure, Ruby is still too young to nap consistently, so she’s right out. But Trixie and Mocha are old pros in the nap game. In the end though, we gave the title to Kerry (mostly based on seniority, but don’t tell her I said that). Mocha is looking to take over next year. WEEK: 25 // That little thing growing in Kerry’s belly is the size of a rutabaga. A rutabaga! Can you believe it?! Hold on … I have to go look up what a rutabaga is. … Hm, looks a lot like a turnip. Well that’s what’s in there. Hopefully week 26 is something I recognize. FEELING: I’m feeling stressed. That’s right I said it. It’s not all fun and games around here. I’m stressed! We have an 11 month old dog that still thinks she’s a puppy, we own two houses and are splitting our time between the two, and Kerry is 25 weeks pregnant! I spend 9-10 hours at my job every day and then a few hours driving back and forth between the houses… oh you probably wanted to know how Kerry is feeling. She said, “Pretty good” when I just asked her. DOING: Moving. Always moving. Our time is balanced pretty evenly between both houses. Kerry is spending a lot of time doing whatever she can, and working on little projects for some fun events we have coming up. I am doing all the heavy lifting that Kerry can’t do. Lots of heavy lifting. EATING: Whatever Blue Apron sends us. Have we talked about Blue Apron on this blog? We really enjoy it and are learning a lot about cooking from the weekly meal delivery. Did you know that we both love shallots? We didn’t either, until about two weeks ago. And who would have thought red wine vinegar was so good?! Food is crazy, right? CRAVING: Kerry says things like, “I don’t think I have any cravings.” And then she also says things like, “All I want in the world right now is a cheeseburger.” So yeah, mostly cheeseburgers. WEARING: I’m wearing jeans and a t-shirt. Kerry’s wearing her Nap Team Captain outfit. Typical Friday. MISSING: Hallmark Movies & Mysteries. We had to change cable packages, and the new channel line up doesn’t have Hallmark Movies & Mysteries. So let me tell you a story. The other night Kerry was watching a movie on this station. I said, “You might not want to tell your friends that you spend your nights wearing a Nap Team Captain shirt and watching Hallmark Movies & Mysteries.” She asked if it would sound cooler if she watched hours of Chopped like I do. Well played, Kerry. Well played. LOVING: How close we are to finally moving. We’re getting there. We are getting very close. Hopefully we’ll be ready to move very shortly. And that’s our update! Have a great weekend everyone.